A painting of a female face with colourful drips of paints forming the shape of the face with Ankara print on the background. The lady was fairly decorated with flowers around the head. This painting is inspired by snapchat generated pictures, I notice the acceptance of the app most especially by females as more beautifying phone cam with various filter. Women embraces anything that can make them beautiful, they adore their body most especially the head. 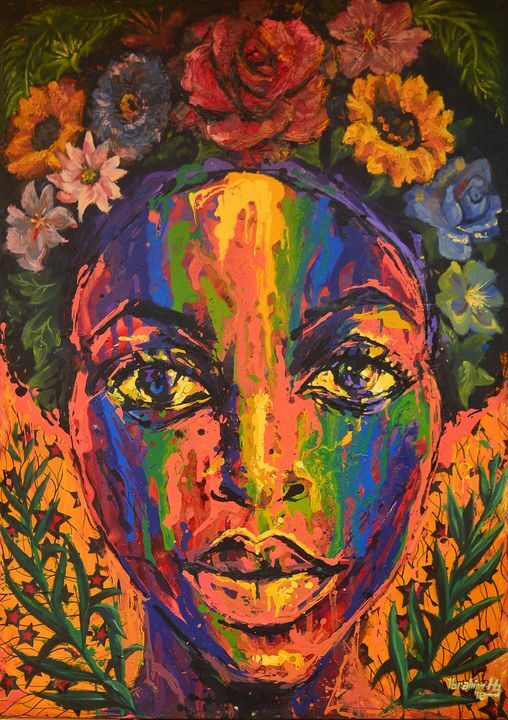 Inspite of this, the painting celebrate the struggle, strength and virtue of a lady as more attribute that makes them so adorable. Ibrahim H. Bamidele is a Nigerian visual artist. A graduate of painting(H.N.D) Yaba college of technology Yaba,Lagos. He was Born 13, February 1992 in Lagos state, Nigeria. He trained as an Apprentice at Talents art kingdom while in secondary school and formal training at Yaba College of Technology. 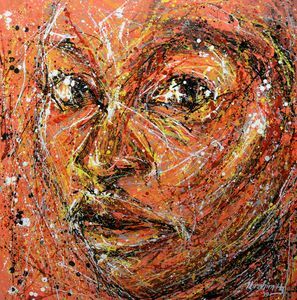 He works in various medium and materials and his subject and inspiration evolves around his immediate environment, personal experiences and cultural perception. His works addresses political,religious, societal and daily humanity themes. His expressive style is characterized with rough brush work, multiple colours splash and pouring techniques. 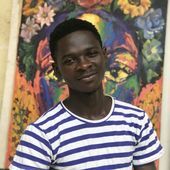 He has participated in various art group exhibition and Competition including customer framework(LBS 2018), Iganmode art fair (OTA 2018), forme feminee (Thought Pyramid 2019).